At current situation, how does one know the right stock to invest in and that too at the right price which will ensure strong returns in the long term? This will be a question that will be the uppermost in the minds of most investors wanting to allocate part of their funds towards stocks. Especially in light of the heightened volatility in the markets in the past. For instance, take a look at the period between 2005 and early 2008. During that time, there was a general sense of euphoria prevailing in India what with the country consistently logging in growth rates of 9% plus and the stock markets zooming to 21,000 levels. And then this optimism snapped. The global financial crisis reared its ugly head and sent global economic growth and world stock markets including India into a tailspin. Suddenly there was nervousness all around. Forget bad stocks with bad fundamentals, retail investors in India were loathe to put in their money even in good companies available at attractive prices fearing that prices will fall down further. Then 2013 dawned, signs of recovery began to be noticeable and stock markets surged once again. And with stable government in place, major indices Sensex and Nifty made all time highs this year. Before the demonetisation event, India was on the track of recovery with factors like normal monsoon, seventh pay commission, public infrastructure investments and low crude oil price favouring it. However post demonetisation and later with implementation of GST this year, we have seen sluggish growth over last 2 quarters. We expect that the government will act to re-stimulate the economy and therefore we expect Indian economy to grow at a faster pace in coming quarters. Corrections in bull market are healthy and give opportunity to invest. Such corrections in bull markets do test your patience and conviction. If you expect a straight-line appreciation in stock markets, that is not going to happen. Profit bookings at regular intervals bound to bring the indices lower. The idea really is not to time the markets. That is a feat best left to speculators. For long term investors, even at present when overall valuations of companies seem on the moderate side, there will still be some stocks that they can look to add on to their portfolios. These stocks if picked at the right price by proven approaches can turn into multi-bagger opportunities. We are pleased to share that Hidden Gems (Unexplored Multibagger Small Cap Stocks) and Value Picks (Mid Caps with Plenty of Upside Potential) recommended by our equity analysts in 2017 have outperformed small and mid cap index by wide percentage points ensuring much better returns for our members. As illustrated in the table above, average returns (as on date) of Hidden Gems stocks recommended in 2017 till August is 23.5% compared to small cap index average returns of 16.4%. Our Value Picks stocks of 2017 also outperformed Mid Cap Index. 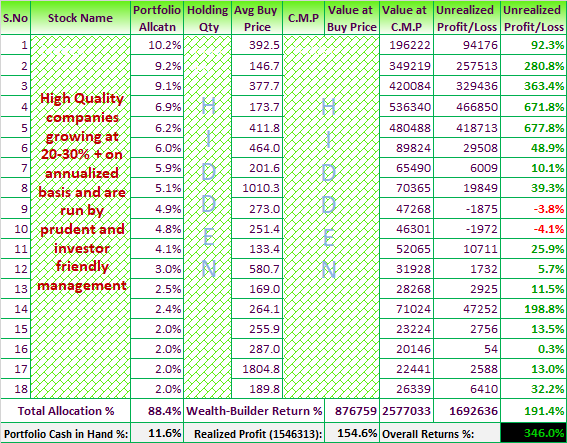 Average returns (as on date) of our Value Picks stocks is 39% compared to average returns of 13.8% of mid cap index. Under our Wealth-Builder service, we encourage our members to replicate our Wealth-Builder portfolio by investing in selective high quality small and mid cap companies. These companies are reporting 20-30% + annualized growth and got their due share of re-rating and delivered exceptional returns to our members so far. Since 1st Jan 2013, Nifty has given returns of 70.5%, Sensex returns is 65.4% where as Wealth-Builder portfolio has given returns of 346% returns to our members. In case you have not yet started building a portfolio of high quality and fundamentally strong growth stocks for long term wealth creation, please find below the Wealth-Builder portfolio allocation & performance update for your reference. We also take this as an opportunity to inform our readers that our Combo - 2 (Annual subscription of Hidden Gems, Value Picks and 15% @ 90 Days) is the best selling subscription service at Saral Gyan, we have registered maximum subscription of Combo 2 since beginning of this year followed by Combo 1 subscription which includes Wealth-Builder (an offline portfolio management service) also. We keep on updating our members on our past recommendations suggesting them whether to hold / buy or sell stocks on the basis of company's performance and future outlook.